"There was not a space in the heavens equal to twice the moon’s diameter which was not filled every instant by shooting stars," Humboldt wrote. Other experts in celestial mechanics noticed a striking resemblance of the Leonid orbit to that of the newly discovered Periodic Comet Tempel-Tuttle. This relatively small comet is in an orbit that at its closest point to the sun almost coincides with the Earth’s orbit and also moves through space in a direction opposite to Earth. More than a decade has now passed since the comet’s most recent visit, and the Leonids are now producing far more modest displays. 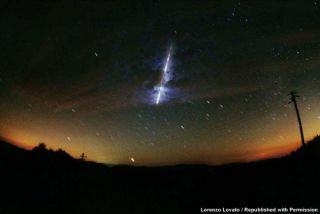 At their peak, perhaps a dozen or more meteors might be seen streaking from out of the Sickle of Leo. It seems that we’ll have to wait until Tempel-Tuttle returns to the vicinity of the inner solar system in 2031 for the next great Leonid cycle.